If any photographer takes pictures for long enough, they'll encounter each and everyone of these unwritten rules. Nobody ever tells you about them, they are learnt from being out there in the world with a camera. Here are 26 unwritten rules as we've experienced them. They're a bit of fun, tongue-in-cheek but with some truth to each one. Have we missed any? 1. Always duck a little when walking in front of someone else with a camera. (But never enough to be completely out of shot). 2. On every shoot, take all of your kit regardless of whether you’re likely to use it. 3. Always being surprised how heavy your camera bag is. 4. Whenever you take off your lens cap, put it in the last place you’ll look for it. 5. If you have any kind of big lens, carry it over your shoulder because you know, pro. 6. When shooting street photography you don’t have to ask anyone’s permission to take their picture (But shouldn't they, really?). 7. If you look like a pro, someone will want to show you how good their photographs are on their phone. 8. After buying flash modifiers never use them because they’re rubbish. 9. What ever scene you want to shoot, that requires a different lens, will have vanished by the time the lens is changed. 10. If you look like a pro, children will ask you how much was your camera? 11. Photography shoots with animals are always directed by the animal. 12. You are not the first person to take that picture. 13. If you look like a pro someone will want to know for what newspaper you're shooting. 14. Tell someone you're a photographer and they tell you you should have been somewhere recently to capture something amazing with your camera. 15. Our next gear purchase will make us a better photographer. 16. The best picture comes from the end of the shoot. 17. If you look like a pro someone will want to know what you’re photographing? 18. Shooting just after Christmas, someone will ask you if you got a camera for Christmas. 19. Someone will tell you photography isn’t the same since digital. 20. If you look like a pro with a tripod someone will try to move you on/ask you if you have permission/threaten to call the police. 21. You’ll take more pictures on your phone than you do your DSLR but after, wish you’d used your DSLR. 22. Take your tripod and then handhold. 23. There will always be a better photographer than you. 24. You could have taken that. 25. Your favourite composition will always be the most out of focus. 26. Only by getting out there and taking pictures do we become better photographers. If you think we've missed one, please add it to the comments below. 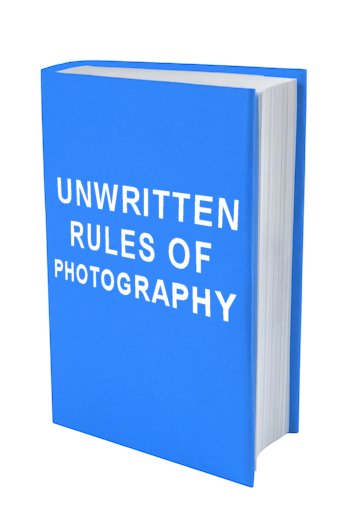 We'd love to hear about your unwritten rules too!